Pesto, derived from the Italian verb ‘pestare’ which means to crush or pound, was a peasant-food before making it to the tables of the elite; only the farmers knew how to make it and make it well, and it depended on the season and the ingredients in hand. Here are some of our Italian-inspired dishes that pay tribute to this humble, yet delicious sauce! Due to their nomadic nature and ambitious military-conquest plans, the Arabs retreated from Sicily leaving behind a recipe of ‘itriyya’, an ancestor of the now popular spaghetti. The poorer Sicilians altered the recipes to suit their needs and, voila, spaghetti was born. Toss al dente spaghetti, zucchini and mushroom with freshly pounded coriander pesto, top them off with parmesan and a glug of olive oil, and you’ve got a creamy, delicious hit meal! Served with multi-grain garlic bread. Depending on the season and the ingredients in hand, the farmers in Italy could crush, pound and whip up a pesto sauce in no time. Formerly a peasant-staple and now a gourmet sauce, this pesto gets an Indian twist of taste. Diced paneer tossed in a home-style basil-pesto sauce graces a thin-crust pizza base before being rounded off by diced red and yellow peppers, mozzarella and parmesan and baked to a fine hot-out-of-the-oven beauty. With only six key ingredients used to make a deep green, delicious pesto, you may feel that it is all too simple. After all, one simply must pound them all together… right? Wrong! Putting a simple pesto together is quite complicated. In fact, there’s a consortium in Genoa that ensures that only the ‘true pesto’ made with the right balance of flavours gets its due respect. A hint of almond gives our basil pesto a creamy depth. Peppers, zucchini, broccoli, black olives and penne are tossed in and finished off with herbed seasoning and grated parmesan. Relish the herbalicious Italian delicacy! 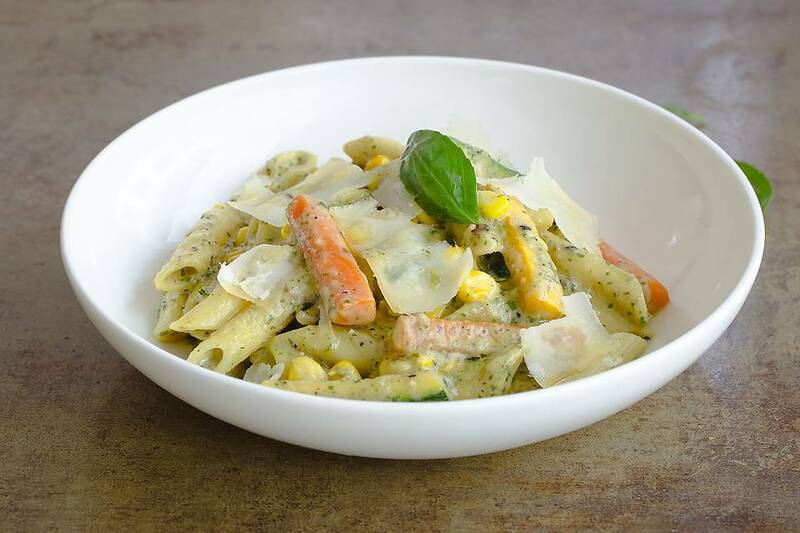 The earthy flavours of creamy pesto sauce combined with the crunch of fresh veggies such as zucchini and black olives and a dash of black pepper will have you craving for more. Check out our menu for more pesto delicacies!